When did Ayaka get so pretty? You’re probably already aware that S/mileage’s second major single, Ganbaranakutemo ee nende, release is just around the corner. (A month, just around the corner. Same difference) We also have some pretty decent sized pictures of the covers. And I am completely in love with the covers. 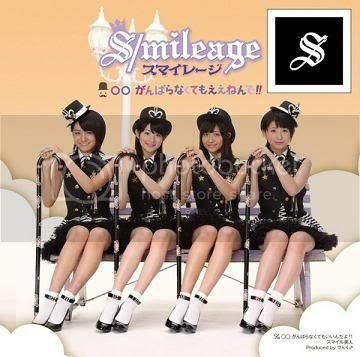 S/mileage always hits it out of the park when it comes to covers. With the exception of Yume Miru 15sai. So, it was a no-brainer that this cover was going to be great too. As you know I never waste an entire post for just covers being released, so on to the main point. The main point being Ayaka. I am completely blown away by how good Ayaka looks on the covers. It’s like all of a sudden her beauty snuck up on me. Like while I was looking all of a sudden she became gorgeous. It’s not like Ayaka was ulgy before. It’s just I never really paid much attention to her. My eyes are always glued to Kanon and Yuuka. And it’s weird because she looks exactly the same in Yume Miru 15sai. You can tell how I’m obviously biased. But since they took, what was probably garden clippers, to the gorgeous locks of my beloved Kanon my eyes weren’t immediately drawn to her. I swear Kanon’s hair is a travesty! XD Yuuka does look absolutely adorable on the cover, Ayaka just blows everyone out of the water. To me she just dominates the covers, and over shadows everyone else. I can just not get over how incredible she looks. But my favorite cover by far is the one in the black outfits. It’s just too cute. Even though they look like they’re going to break out into tap dance any minute, I love it. Here are the other 3 covers for anyone who is interested. I want the PV to be released right now! I don't think it will really effect me much, since she isn't my favorite member anyway. That thing about foreigners is an error in translation -_- she didn't mean that lol. I agree…Ayaka used to be a blend-in with Shugo Chara Egg, but she's starting to really stand out! I do not approve of Kanon's hairstyle! I normally like long hair over short hair, but Saki's is still ok…but Kanon's is TOO short! Its like…they cut it, then they made a mistake, so it ended up being too short? Exactly! She looked so bad in Shugo Chara Egg. lol. I usually prefer long hair too, but it really depends on the person. It does seem like they messed up cutting it. I really hate it! :/ Kanon is usually super adorbale, now(to me) she gets over looked. I don't think they're trying to make her the tomboy. Since S/mileage's whole image to to be super cutesy. It wasn't really that long. lol. ♡Amy ♡: @uemurasayu I'll have to give this round to you, nothing can beat Ponpon. Lol.